Fifty years ago when excitement over the arrival in Ireland of the dawn redwood (Metasequoia glyptostroboides) was at its height, the question was asked, 'Are there other fossil plants still to be found?'. The dramatic discovery of the Wollemi pine (Wollemia nobilis) in 1994 gave a resounding answer to that question. The exciting appearance of an evolutionary line believed to be long extinct is all the more incredible by its discovery as tall beautiful trees in the Wollemi National Park less than 100 miles from Sydney, Australia's largest city. Wollemia nobilis is not a pine but a member of the monkey puzzle family Araucariaceae. Its leaves look something like those of a monkey puzzle but are much more gardener friendly. Its female cone structure is similar to that of Agathis. Fossil remains of foliage and cones scales closely resembling those of the living plants occur in rocks between 65 and 200 million years old when the monkey puzzle family and other cone-bearing trees were a much more important component of the world's vegetation than they are today. Since then these plants have declined in importance, with many species becoming extinct being replaced by the more successful flowering plants. Scientists believe that Australia's Wollemi pine and China's Dawn Redwood survived because they grew in isolated places such as deep gorges and so were protected to some extent from climatic extremes, forest fires and flooding. The sight of a beautiful young plant on display in the Botanical Gardens, Sydney immediately prompts the questions, 'Will the Wollemi pine thrive in Ireland and when will plants be available?' Until trees are planted, it is not possible to be definite on how well our climate will suit it. [*] In New South Wales the Wollemi pine grows in warm temperate rain forest in the bottom of deep canyons along with Coachwood (Ceratopetalum apetalum) and Sassafras (Doryophora sassafras). Eucalyptus species dominate the tops of the ridges and canyon walls. Coachwood is not hardy below -2 C and does not survive in Ireland. On the other hand Sassafras thrives on Howth along with many Eucalyptus species from New South Wales such as E. pulverulenta, E. parvifolia and E. cinerea. This suggest that there is a good chance that the Wollemi Pine could survive outdoors in Ireland at least in the milder parts. [*] Plants were brought to Ireland in 2005, seven years after this article was written. 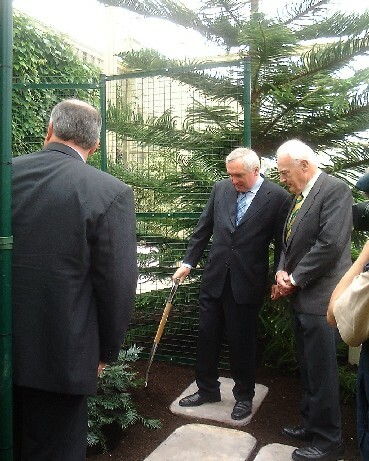 An Taoiseach, Bertie Ahern T.D. 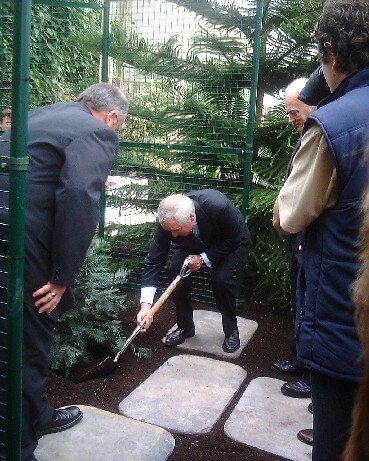 accepted the first Wollemi Pine from the Australian Ambassador to Ireland, His Excellency Dr. John Herron at a planting ceremony at the National Botanic Gardens, Glasnevin, Dublin, on the 10th September 2005. The ceremony was hosted by Dr Peter Wyse Jackson, Director of the National Botanic Gardens. 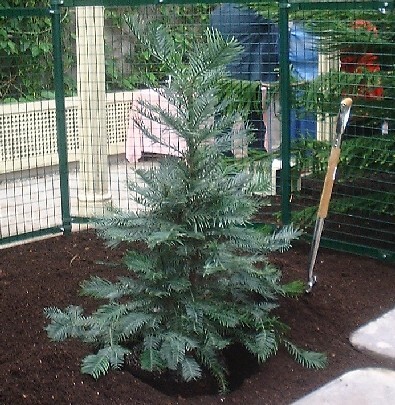 Also, a couple of years later, Earlscliffe received its own Wollemi Pine and it is now growing exceedingly well here.